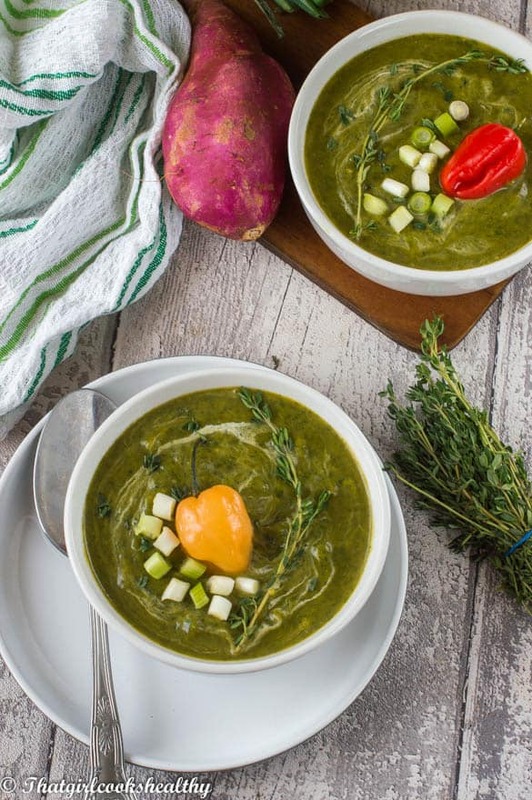 Caribbean callaloo soup recipe – nourish your body with this heart warming leafy green thick and equally as flavoursome vegan style soup. 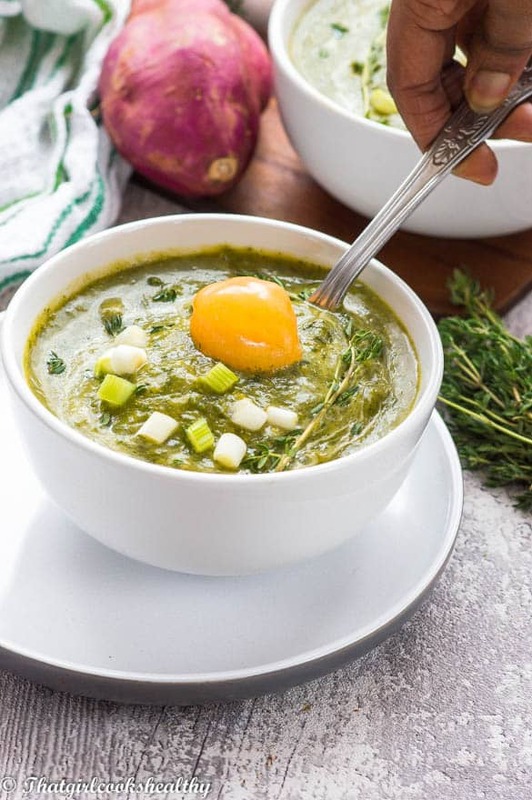 If you love delicious, hearty soups with a Caribbean flare to them, then this Callaloo soup is perfect for you. I must admit I exceeded my own expectations with this one. I doubted my ability to find the correct substitutes to retain that lovely flavour but trust me when I say this recipe is a crowd pleaser. What is callaloo and it’s origins? Callaloo is a dark leafy vegetable from the same family as spinach. It was brought from west Africa during the transatlantic slave trade. 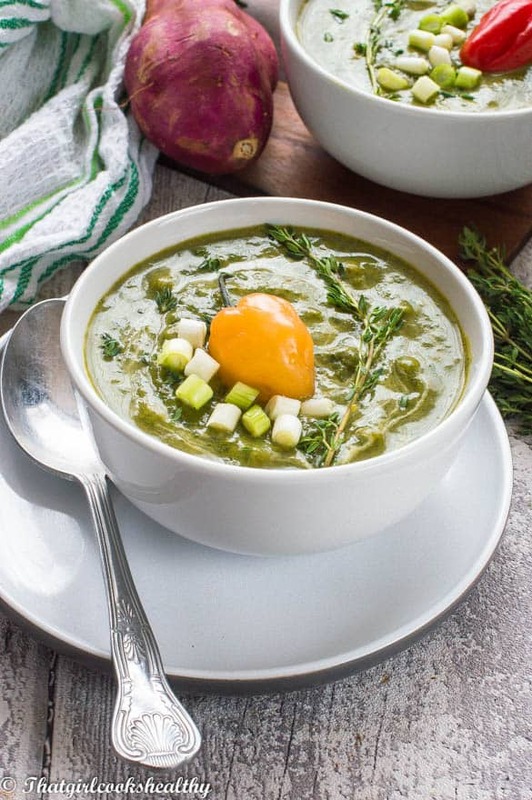 When slaves settled in the Caribbean they found many ingenious ways to cook callaloo including in the form of soup. They also draw inspiration from the indigenous Amerindian people who inhabited the land prior to their arrival. 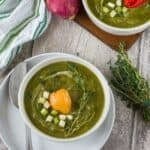 Do all Caribbean islands have callaloo soup? 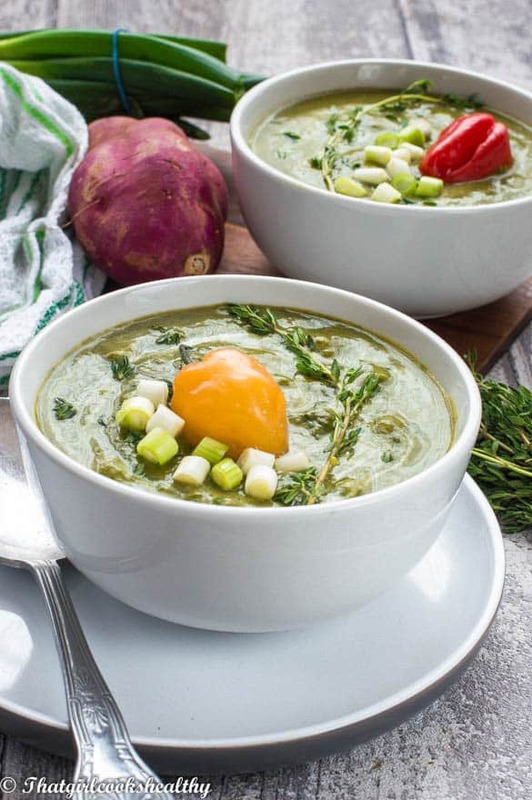 Callaloo soup is made differently by almost every island, there is no right or wrong method, it’s simply a case of following ones own cultural upbringing. For instance Trinidadians make callaloo using dasheen (taro) leaves. On the other hand, other islands such as Grenada and Dominica have a tendency to add an assortment of meat and use the callaloo leaf not dasheen leaves. Jamaicans, Guyanese and Antiguans call the meat variation Pepperpot soup. This all may sound overwhelming to an outsider but the key ingredient throughout is either callaloo or dasheen leaves. My variation omits the meat and puts more emphasis on using green vegetables. Unfortunately, I wasn’t able to get hold of any fresh callaloo at the time of cooking but that’s okay because spinach is a popular replica. This long list of ingredients may seem intimidating at first glance but I promise it’s nothing a rookie cannot handle and the results are truly worth the prep work. To bulk up the soup with sweet notes, I incorporated butternut squash and sweet potato – healthy clean starch and complex carbs. The coconut milk and vegetable stock help to liquidise the solid veggies. Although it is best to chop them finely or better yet dice them up. 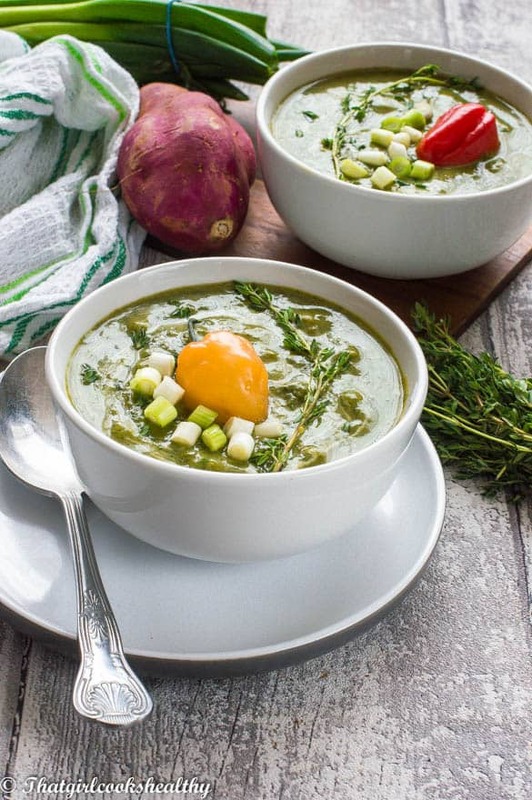 Okra (ladies fingers) is another veg which plays a crucial role in this green leafy soup. As always to begin with you will sautee the onions and garlic and add the other veggies – scallion, onion, scotch bonnet, okra, butternut and sweet potato. From there sprinkle the spices over the veg whilst they sweat in the pan and infuse the condiments. Add the spinach towards the end along with the stock and coconut milk. The pan may seem overcrowded but the volume will reduce with time. How long will it take to make the soup? You can leave the mixture to breakdown into a thick stew for up to an hour. I normally intervene around 30 minutes -45 minutes when the kitchen is filled with a tempting aroma where I’m greeted with a thick herbaceous stew. Now it’s time to liquidise, don’t liquidise too much, embody the soup by using a immersion stick blender and pulse to your desire. this recipe is paleo, gluten free, vegan and dairy free! Start by heating the coconut oil a in large heavy based saucepan or casserole dish over medium heat. Now sauté the onion, scallion and garlic for 1 minute, until the onions are soft. Add the diced butternut, sweet potato, okra and scallions and fold in with the sautéed onions and garlic. Proceed to add the scotch bonnet, thyme, black pepper and salt, while stirring into the veggies. Tip the spinach/callaloo into the pan, the pan may seem overcrowded at first but the spinach will wilt and the remaining veggies will breakdown during simmering. Pour in the coconut milk followed by the vegetable stock and reduce the heat to low. Cover the pan with the lid and allow to simmer down into a thick stew for up to an hour, stir often to prevent sticking while it thickens. Once the desired thickness is present, use an immersion stick blender (discard stem if using fresh thyme) to partially liquidise into a more soup like texture. This recipe is suitable for home freezing. This looks super healthy, what a great way to ensure you get your veggie intake! I’ve never heard of callaloo before, so thanks for suggesting the spinach substitute. I’m interested to try the ‘real deal’ though. Where would you usually find this kind of exotic vegetable? Thank you, callaloo can be found in any neighbourhood that has an Indian or afro Caribbean ethnic group. The stores frequented by those groups of people will usually stock it, but spinach is a very good replica. I am planning on making your recipe for a school project. I was just wondering how much soup the recipe yields. Please let me know. I can’t wait to try it. At a guess I would say approximately 4 people. Just made your soup for dinner (and leftovers for the week). Living for the year in Barbados and wanted to cook something ‘local’ but everything local has lots of animal and animal fat in it. Was glad to find this veg work-around. I got callaloo from the grocery and had butternut squash, okra, scotch bonnet, and thyme from my landlord’s garden, so it was quite local. Hi Tasha. I’m happy to hear my recipe fitted right into your lifestyle requirements. I cannot use coconut milk what can i substitute? Will organic coconut milk work? I cannot use coconut milk what can i substitute? Will organic coconut milk work? Also the stock can it be organic? Yes, organic produce is always preferred. You can indeed use both organic coconut milk and stock and yield the same results. I really enjoyed callaloo growing up, but never had it in a soup. Sounds really good! And I love that it’s vegan! I only just started drinking callaloo soup as an adult so you are not alone. These are the same leaves we use in making the Nigerian Efo-Riro (amaranth leaves), I love that i’m learning the Caribbean way from your blog. Looks delicious! No problem! Our cultural cuisines are very similar with a small difference. I’m a huge Callaloo fan. Thanks for blessing us with such a delicious looking vegan option! My grandfather LOVES his callalou! I need to make this for him! Thanks for including the origin of callaloo! I need to try this out.